(Chattanooga, Tenn.) – During a ceremony this evening Fairyland Club on Lookout Mountain, the Civil War Trust, a national battlefield preservation organization, will recognize three outstanding historic preservation advocates with its Chairman’s Awards for Achievement. The awards, presented by the Trust’s chairman, Henry E. Simpson, will honor Alabama historian Daniel Fulenwider, Chickamauga and Chattanooga National Military Park historian James Ogden and Tennessee Civil War Preservation Association executive director Mary Ann Peckham. For more than two decades, Daniel Fulenwider of Cullman County, Ala., has worked to promote appreciation and understanding of “Streight’s Raid” — Confederate general Nathan Bedford Forrest’s pursuit of Col. Abel D. Streight across north Alabama in the spring of 1863. He has led tours of the campaign for military personnel from 27 countries and has traversed the entire route, from Mississippi to Georgia, on foot. He was instrumental in orchestrating the Trust’s efforts to purchase of land at Hog Mountain, scene of fighting during the Battle of Day’s Gap, and continues to be involved in efforts to promote and interpret the site. Mary Ann Peckham is the Executive Director of the Tennessee Civil War Preservation Association a statewide organization dedicated to the preservation and interpretation of Tennessee Civil War Battlefields. She retired from the National Park Service in December 2000, after serving in six National Park areas. Her final assignment was as Superintendent of Stones River National Battlefield in Murfreesboro, Tenn. In addition to her work with TCWPA, she is active with a number of area conservation organizations, including serving on the advisory board of the Southeast Region of the Land Trust for Tennessee. Beyond his involvement with the Civil War Trust, Simpson is a member of the law firm Adams and Reese/Lange Simpson, LLP in Birmingham, Ala. He has previously served as a lecturer at the University of Alabama, the state chairman of the U.S. Supreme Court Historical Society and the state chairman of the American College of Trial Lawyers. Manassas was where today’s battlefield preservation efforts began, with an assist from Fredericksburg. A hundred and fifty years ago Thursday near this railroad junction, terrible bloodshed occurred. Millions know the event today as the First Battle of Manassas (or Bull Run in the North). A year later, a second fight was waged on some of the same ground–the Second Battle of Manassas. Both were Confederate victories, each profound in its impact. Fewer people have heard of the 1980s Third Battle of Manassas or know that its efforts were also profound, in very different, and less warlike, ways. The third battle, fought here and in the halls of Congress over a shopping mall and mixed-use development nearly built on part of the Second Manassas battlefield, fostered a national preservation movement that continues today. It is on the minds of many people in and around Manassas now as thousands mark the 150th anniversary of the Civil War’s first big battle. In encounters and interviews here this week, the topic came up time and again. It was just so for historian Joan M. Zenzen, author of “Battling for Manassas,” who was at Henry Hill–heart of Manassas National Battlefield Park–on Thursday to give a talk to visitors and sign copies of her book. Her work chronicles the battle over the William Center project in western Prince William, next to the park, and all that it led to. Acquiring that tract, through a legislative taking, cost the nation $134 million. It made advocates and government officials realize there had to be a better way to save Civil War sites and avert messy spats. A. Wilson Greene, then a historian in Fredericksburg, was one. A Manassas-like “eleventh-hour-and-fifty-ninth-minute rescue operation, at a cost that is so astronomical, is simply not a blueprint” for preservation, he told Zenzen. In June 1987, Greene and some 30 others met in Fredericksburg to size up events at Manassas and also-threatened battlefields at Brandy Station in Culpeper County and Chantilly in Fairfax County. They formed the Association for the Preservation of Civil War Sites, based in Fredericksburg. The nonprofit mapped 75 battlefields to identify land to be saved, raised money and bought thousands of acres. In 1999, the APCWS merged with the Civil War Trust, which carries on its work today. “The preservation controversies at Manassas gave birth to the modern battlefield preservation movement,” said Jim Campi, the trust’s policy and communications director. The National Trust for Historic Preservation, led by Richard Moe, and the National Parks and Conservation Association were other key players in the Manassas fights, Zenzen said. The two groups remain active in preservation today, recently in the Wilderness Walmart flap in Orange County. Fresh off the heels of the William Center mess, Spotsylvania Countyopted to support preserving part of Confederate Gen. James Longstreet’s flank-attack site at Fawn Lake. “Officials were saying, ‘Let’s do this, because we don’t want another Manassas mall [controversy],'” Zenzen said. Manassas also spawned a bunch of local battlefield-advocacy groups that are critical to efforts today, she said. “They have their fingers on the pulse, rally the troops early, get funding from local people and know the local politics, which is ultimately very, very important,” Zenzen said. She pointed out the work, in the Fredericksburg area, of the Central Virginia Battlefields Trust. In Washington, the Manassas spectacle prompted Congress to charter the Civil War Sites Advisory Commission, whose study remains the bible for battlefield preservation, and to create the American Battlefield Protection Program, a small agency that continues the commission’s work and provides matching-dollar grants for land acquisition. One measure of how far things have come since 1987 could be seen Wednesday at Brawner Farm, a part of Manassas National Battlefield Park that is a stone’s throw from the spot where the Manassas battle re-enactments will be held today and tomorrow. State and federal officials and Civil War Trust members gathered at Brawner’s 19th-century farmhouse to herald a land deal stitching together pieces of Deep Cut, where the Second Battle of Manassas was decided. They announced that 54 private acres within the park’s congressionally authorized boundary–an inholding or so-called “doughnut hole”–were being donated to the trust by Service Corporation International of Houston and conserved by the Virginia Department of Historic Resources. Douglas Domenech, Virginia’s secretary of natural resources, called the news the latest example of the “great strides” the state has made in battlefield preservation. Such efforts are good, Domenech said, for what he called “the three E’s”–education, the environment and the economy. “The great number of tourists, spectators and re-enactors coming to Manassas to witness the anniversary events this week is proof positive that a well-preserved battlefield is an economic boon for the community and the commonwealth,” he said. The Civil War sesquicentennial gives fresh urgency to preserving battlefields, said Domenech and Jon Jarvis, director of the National Park Service. Jarvis said that Ken Burns discovered that truism while researching his recent PBS documentary “America’s Best Idea,” on the creation of the national parks. “It has always been up to individual people who stepped up at critical times and devoted their lives to the protection of these places,” he said. On Thursday, as the Battle of Manassas’ 150th-anniversary hoopla swirled around her, Zenzen independently echoed that idea. Vigilance will always be essential, she said, no matter how many battlefield acres nonprofits and government agencies are able to save. “You have to constantly remind people what’s the value of these landscapes and of the battlefield parks–why is it that we don’t want to widen Lee Highway right next to the Stone House at Manassas and don’t want to have 10 cellphone towers on the horizon from Henry Hill, or high-rises right next to the Wilderness battlefield,” Zenzen said. RICHMOND, Va. (AP) — Manassas Battlefield is expanding on the eve of the 150th anniversary of the first great land battle in the Civil War. The Civil War Trust, the National Park Service and state and local officials are announcing the successful preservation effort Wednesday in northern Virginia, one day before formal ceremonies marking the anniversary of the Battle of First Manassas, or Bull Run, on July 21, 1861. — The Stonewall Memory Garden, which involves 44 acres. Thirty-four of those acres will be conveyed by the owner, Service Corporation International, to the trust, while the remaining 10 acres will be conveyed to the Virginia Department of Historic Resources for preservation. The total value of the land is $1.125 million, according to the trust, which intends to donate the 34 acres to the National Park Services upon expansion of the park’s authorized boundary. SCI agreed to sell the land for $100,000, provided the property become part of the park, the trust said. Preservationists said they feared the land, known historically as the Dogan Farm, would ultimately be developed commercially. — Smith and Gray Tracts, which were acquired by the trust last year for $570,000, including a $104,800 matching grant from the Virginia Civil War Sites Preservation Fund. Both tracts are destined to be transferred to the park service. “When you bring all those forces together, there’s a recognition these grounds should be saved for the future and not just turned into commercial development,” National Park Service Director Jonathan Jarvis said Tuesday. The properties are “directly related to the battlefield” and are welcome additions to the 5,000-acre Manassas National Battlefield Park, he said. Federal battlefield preservation totals approximately $5 million annually. “It doesn’t go far,” Jarvis said. “Setting aside these hallowed grounds for the education and enjoyment of future generations will be a lasting legacy of the sesquicentennial,” he said in remarks prepared for delivery Wednesday. The official commemoration of the First Battle of Manassas is scheduled Thursday and continues into the weekend with Civil War re-enactments. While the Civil War began at Fort Sumter in South Carolina, Jarvis said the first blood was shed at Manassas. Some 5,000 were killed or injured in the battle, a Confederate victory that sent federal forces reeling in panicked retreat back to Washington after hours of fierce fighting. The park service is preparing for a major turnout of re-enactors amid a forecast of temperatures near triple digits. “I’m sure there’ll be a lot of plastic water bottles at this event, which are not all that historically accurate,” he said. “We’ll make sure everybody is well-prepared for what could be a very hot weekend. (Chantilly, Va.) – During a ceremony this morning at the Westfields Marriott Washington Dulles hotel, the Civil War Trust, a national battlefield preservation organization, recognized two outstanding historic preservation advocates with its Chairman’s Awards for Achievement. The awards, presented by the Trust’s outgoing chairman, John L. Nau, III, honored Manassas National Battlefield superintendent Ed Clark and Virginia Sesquicentennial of the American Civil War Commission executive director Cheryl Jackson. After a 21-year National Park Service career — all of it spent at parks in Virginia — Ed Clark was named superintendent of Manassas National Battlefield in 2008. Since then he has quickly gained a reputation as a bold advocate for land preservation and resource protection. His willingness to think creatively and his capacity for working effectively with partner organizations have revitalized preservation efforts at the park. Under his leadership, Manassas National Battlefield has truly embraced its unique role in the Civil War sesquicentennial and is setting a high bar for other sites as they prepare to mark their own 150th anniversaries. A 23-year veteran of Virginia state government, Cheryl Jackson has been the driving force of the Commonwealth’s efforts to mark the Civil War’s 150th anniversary since the 2006 creation of the Virginia Sesquicentennial of the American Civil War Commission. Her vision and persistence have led to creative initiatives that will help bring Civil War history alive for tens of thousands of Virginians. From mobile museum exhibits to state-of-the-art equipment travelling across the state to scan and digitize family heirlooms like diaries, photos and letters for posterity, Jackson has led the charge to find meaningful ways for the public to experience this milestone. Beyond his involvement with the Civil War Trust, Nau is the immediate past chairman of the federal Advisory Council on Historic Preservation and the Texas Historical Commission. He serves in leadership capacities with a variety of charitable entities and is president and chief executive officer of Silver Eagle Distributors, L.P., the nation’s largest distributor of Anheuser-Busch products and the number one beer distributor in Texas. Links to Manassas Battlefield Park and Virginia Sesquicentennial Commission. STRASBURG, Va. — With the grand opening of the Hupp’s Hill Civil War Park scheduled for Saturday, the Cedar Creek Battlefield Foundation has finished its work turning old into new. The park, which can be visited for free from 10 a.m. to 4 p.m. Saturday, features a museum with 1860s artifacts, displays, books and a 30-seat theater, refurbished walking trails and a pair of cannons that will have hourly demonstrations. It is the former site of the Stonewall Jackson Museum, at 33229 Old Valley Pike, and is being leased from the Bernstein Family Foundation. The Strasburg Town Council is scheduled to vote on a memorandum of understanding about also operating a visitor’s center there next week. Foundation President Tim Stowe said the opening weekend will kick off during an invitation-only event Friday night that includes cannons firing. The proverbial fireworks will just about be non-stop from there as officials seek to tell not only Cedar Creek’s story, but that of the 1864 Valley Campaign. The park will be open 1-4 p.m. on Sundays for $5 admission, and then 10 a.m. to 4 p.m. every day except Wednesdays and Thursdays, he said. Stowe said the foundation’s headquarters in Middletown, next to the battlefield, will remain open. Strong interest from people wanting to volunteer and loan items to display has made the past year of getting the project complete more enjoyable, Stowe said. He did not have a cost total, but added that donations are still being accepted. 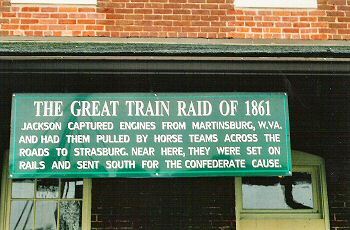 By design, timing of the opening coincides with the war’s sesquicentennial and leads up to Strasburg’s Great Train Raid re-enactment on May 29. “We think that’s a very important aspect,” Stowe said. Nick Picerno, chairman of the Shenandoah Valley Battlefields Foundation’s board of trustees, is the scheduled emcee for Friday’s event. He said Hupp’s Hill will demonstrate the value of heritage tourism and become an important visitor destination. Standing behind the old brick Worthington House, visitors can look down the gently sloping hillside and picture the Civil War battle that likely saved the nation’s capital from capture. Much of the farmland where Union soldiers fought that hot summer day in 1864 to delay a Confederate attack on Washington has been preserved as Monocacy National Battlefield. But the view from the Worthington farm, where the fighting began, appears fated to become less historic. A huge waste-to-energy plant is planned just across the Monocacy River from the 1,650-acre park — a project that has sparked criticism as the nation marks the 150th anniversary of the start of the war. One hundred fifty feet tall, with a 270-foot smokestack, the facility will loom over the trees that hide areas where Confederate cavalry forded the river to assault Union infantry. As history buffs begin four years of events marking the anniversary of a conflict that continues to resonate in American politics and culture today, the land over which blue- and gray-clad soldiers bled and died is coming into increasing conflict with modern society. InMaryland, both the Monocacy and South Mountain battlefields face development pressures from energy projects. Only about 20 percent of the land nationwide on which fighting occurred is preserved, either as national, state or local parks or in private ownership, according to the Civil War Trust, a nonprofit group dedicated to saving battlefields. Even the parks face encroachment by shopping malls, highways, housing developments, cellphone towers and casinos. “A lot of this comes down to a clash between our modern needs and our sensibilities about preserving our resources,” Trail said. Less famous and smaller than the bloodbaths that took place at nearby Antietam and Gettysburg, Pa., the Monocacy battle was noteworthy for the role historians say it played in thwarting the third Confederate invasion of the North. On July 9, 1864, at a critical junction of roads and railroads crossing the Monocacy River, a hastily assembled Union force of 5,800 soldiers confronted a much larger Confederate army bent on attacking Washington, which at the time was lightly defended. The South prevailed at the end of a daylong, seesaw battle that left 1,300 Union soldiers dead, wounded or missing. But the holding action bought crucial time for Union reinforcements to be rushed to the capital, and the invading army withdrew after finding its prize well-guarded. The Monocacy park lies in the shadow of better-known Civil War clashes in the area. Authorized by Congress in the 1930s, it got no money to buy land until the 1970s and didn’t open to visitors until 20 years ago. The battlefield had long since been bisected by Interstate 270, built to connect Frederick with the Capital Beltway. But modern life keeps closing in: A high-tension power line from West Virginia that would have skirted the park has been put on hold — for now. Meanwhile, Frederick, the state’s second-largest city, has slowly sprawled southward toward the park. “We’re this sea of green on the edge of the city,” Trail said. The land across the river from the park has long been zoned for industrial use, though most of the facilities now are hidden by the trees lining the riverbank. That’s where Frederick County‘s commissioners have decided to put the waste-to-energy plant. Blaine Young, president of the five-member board, said he and the other commissioners are committed to building the plant, though he wishes it could be put elsewhere. Other sites were considered, he said, but a previous board decided to put it near the park to save the county money and time. The property is owned by the county, he said, and the plant will burn sewage sludge from the nearby wastewater treatment plant, which would otherwise have to be processed in a costly “digester” facility. “The fact is, we’re so close to Gettysburg, the Civil War heritage we have in Frederick is often overshadowed,” he said. Not far to the west, Middletown-area residents are in a standoff with a Virginia-based company over another energy project. Some residents there fear that a natural gas compressor station proposed in their midst by Dominion Energy will spoil the rural, historic landscape at the foot of South Mountain. The mountain was the scene of another relatively unheralded Civil War clash that proved to be the warm-up for the bloodiest day of fighting in American history — the Battle of Antietam, where 23,000 on both sides were killed, wounded or missing. 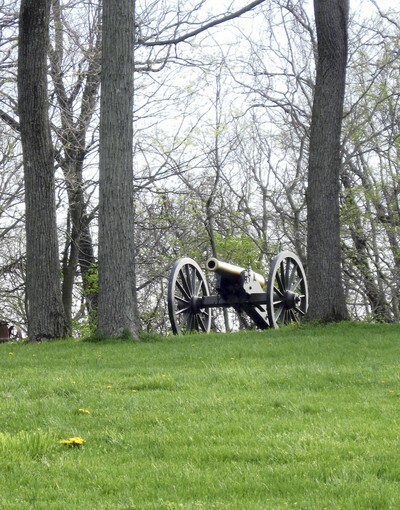 Unlike Antietam, most of the South Mountain battlefield remains in private hands, though the state of Maryland has spent nearly $4 million to protect about 1,300 acres — most of it paying for easements obligating landowners not to develop their property. Two years ago, though, Dominion bought 130 acres of unprotected farmland down the mountain from Fox’s Gap, one of the three sites where fighting occurred. On that tract is a historic stone house known as Fox’s Tavern: Union troops marched by the structure on their way to the fighting, and wounded soldiers were brought back there to be tended, say local residents. It’s currently occupied by a Dominion employee. “This is all farmland out here,” said Elizabeth Bauer, whose home is a few minutes from the old stone house. For the Bauers, the Civil War is a passion. Her husband, Claude, 58, is an enthusiastic re-enactor who dons authentic-looking uniforms to participate in mock battles, parades and living-history exhibits. Elizabeth, 55, joins him at many events, dressing up in period civilian garb. Though she is Canadian, she says a couple of her ancestors crossed the border to fight with the Union. She and a few of her neighbors formed Citizens for the Preservation of Middletown Valley to rally the community against this and other perceived threats. Dominion spokesman Charles Penn said the company is re-evaluating the project, which is meant to boost the flow of gas supplied via an interstate pipeline running through the area. Dominion still intends to complete the project, Penn said, but has no plans “at this time” to develop the land it owns near Middletown. Bauer is taking no chances as long as the company still owns the land. “We want them to go away,” she said. Most visitors drawn to these historic oases in the midst of spreading modernity are unaware of what may be in store. “It’s too bad,” said Bob Sullivan of Morgantown, Pa., after hearing about the trash-to-energy plant as he toured the Monocacy park’s visitors center. This Week in the Civil War note: If you want to help in the battlefield preservation effort, visit the Civil War Trust’s website at www.civilwar.org and make a donation. This is entirely up to you.